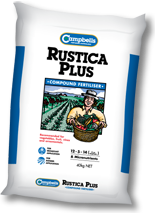 Rustica Plus is a true compound fertiliser, not simply a mixture of different fertilisers pressed into a granular form (a granulated blend) or different fertilisers physically mixed together (a blended fertiliser). The consistent granule size range allows uniform application with no separation of nutrients. Rustica Plus is ideal as a base or top dressing. It is a non-dusting, free flowing product that can be applied as a band or broadcast or can be incorporated into the soil or growing medium prior to planting.